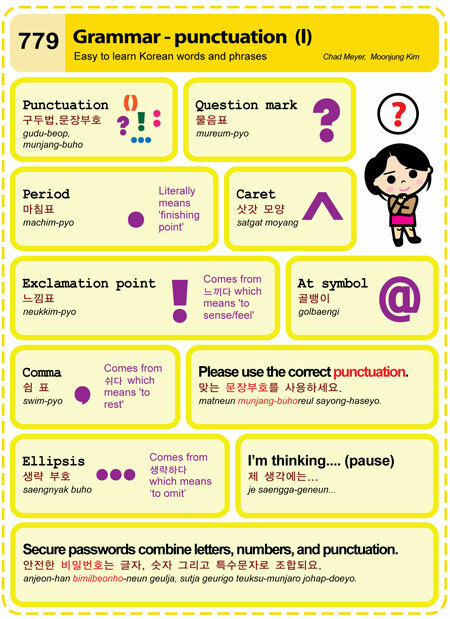 Practice speaking Korean and punctuation! Apple’s Voice dictation is a fun way to practice speaking Korean. Korean is available on your iPhone or iPad; enable it from the menu: Settings > General > Keyboard > Keyboards > Choose Add New Keyboard. Open Notes, Email, Messages or any program that supports voice dictation. Press the globe icon in the lower left to toggle languages to enable Korean. Next, press the microphone icon (next to the spacebar) and start speaking in Korean. -Voice dictation recognizes spoken punctuation too. Try using the terms in this article and see if it can understand your pronounciation. -Mac computers also have Voice Dictation built-in. Once enabled, press the (fn) key twice to begin and once to stop. *Ensure that you have an internet connection for both of these features. This entry was posted in Series and tagged Apple, at symbol, caret, comma, ellipsis, exclamation point, grammar, ipad, iphone, Mac, period, punctuation, question mark, secure password by easykorean. Bookmark the permalink.